TATS A KOOL CHALLENGE: Fourteenth day of December! 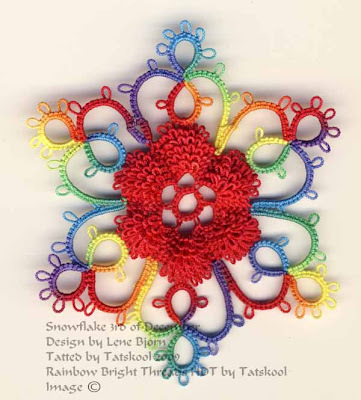 You wouldn't believe how much this tatting challenge is luring me into a false sense of security. In my mind it is really only the 14th of Dec and I am immune to the hustle and bustle going on all around me (well almost!). My mind says...plenty of time left to do everything. I think it might hit me on Christmas Eve that I AM NOT READY!!! HELP! Well there is lots of help here anyway and Son and DIL to be are both so laid back that there is no hassle in Tatskool land. Last night was the coldest we can remember for years, went down to -2.6C with the whole garden and windows covered in really thick, crystalline frost. Yesterday I skidded on an icy corner..the first real skid I have ever had. Today we are waiting until the bright bright sun thaws things enough to take the kids town to see all the changes, a whole new shopping street since they last came. The shops shown on the advertising video clip aren't the ones that actually came. It is about 75% occupied which in a recession is amazing. The shop on the corner called Fink (I think) is now a dedicated Apple Mac shop...superb. the new street which is a widened small lane goes thro' from our main street to our beautiful old art gallery. So if you want a glimpse of my city this is it. Back to business. Today's snowflake was one of the stunningly beautiful easy ones. A lot of work in it but nothing difficult. The thread that I chose is a very, very pastel Altin Basak 50 in pale peach,green.cream. Lets take another look on a black background. Thread amounts. The total was 12.25m, not easy to give amounts for each shuttle as Sh2 did most of the work and so I had to switch shuttles half way thro'. Next time that I do it I would probably put 3m on Sh1 and 10.5 on Sh2. A little extra treat today for everybody suffering Rainbow Bright withdrawal symptoms. Isn't that a wow! and it really does look as bright as that. So now which one do you like the best!!! 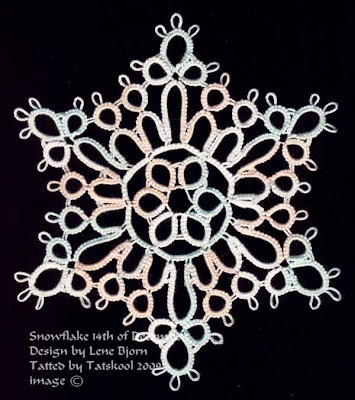 I love your snowflake--so much that I ordered the pattern book. December 14th has definitely past. That's my birthday but because my husband lost his job in July, we couldn't take the whole family to dinner like we usually do so they surprised me and the whole family met at my #2 son's new home and fixed my Grandpa's chicken and noodles for our dinner. Usually by that time, I usually have most of our Christmas preparations done. This year, because of the unemployment problem, I did my very first shopping this morning. Of course I've tatted my mom a couple of special book marks- but most of the family (mostly guys) don't appreciate ny tatting so much. OMG THAT RAINBOW BRIGHT FLAKE IS AWESOME. The color is like "in your face awesome" lol They are both very pretty! I love the Rainbow Brite with the red center... my mom's favorite color! Three and a half pairs of socks to go! Ummm....ermmm...Pamela...I don't know how to break this to you, but it's actually the 22nd day of December and in some parts of the planet it is actually the 23rd day of December. 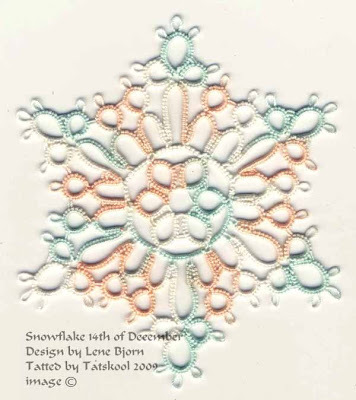 And yes, I know, you're referring to the pattern title of the snowflake you did...which is lovely, by the way! The 23rd it is! - and I am about to deliver a box full of Christmas presents to family members who can't join us this year on the 25th. Hoping to be back home before the inevitable severe storms we've been having. I will always love Rainbow Bright! - but today, just because it is so peaceful, in the midst of chaos here, I am going to vote for the very first snowflake. The glimpse into your shopping street was fun - the video kept stalling so I couldn't see it all. Nice to know that there are places to stay if I ever come to Cork! Hi Beelizabeth, good to hear from you.Hope you have great Christmas. Hi Heather, yup it is in yer face awesome, I so agree. Hi Dane, way to go withe the socks, get back to them!! now. Hi Chic, oh no you can't be correct, it's almost the 15th of Dec here, honest! HI Fox, shhhhhhhhhhhhhh! don't be giving all my secrets away. No one knew about the basement. Trouble is I am running out of little helpers. Fox, it's quite obvious! - of course, there are tatting LEPRECHAUNS helping out, just like my favourite Elves and the Shoemaker. Dec 5th...again and a new thread!